Ouroboros may sound like a simple story about 2 boys who met in the orphanage and set off to get revenge when their foster mother was killed right in front of them, however don’t be fooled by the simplicity of the summary because there’s more that this drama could offer. It has a dark humor hovering around the dialogues, violence, secrets within a secret and the never ending conspiracies from one another. It’s a twisty piece of work that would keep you on your toes, even though at times it is easy to guess who the culprit is, it still does not deter the mysterious death of some characters due to an underlying circumstances in every episode. I knew what I was getting myself into when I started this drama and yet I still watched it until the very end. Though there were a lot of things in this series which I didn't like, there were MORE things which I found likable that it made up for the lack luster of what I was expecting. Another thing about the story line is the ending, it was great that the writers were not afraid to go into that kind of direction for the finale episode. It made me smile and cry at the same time. 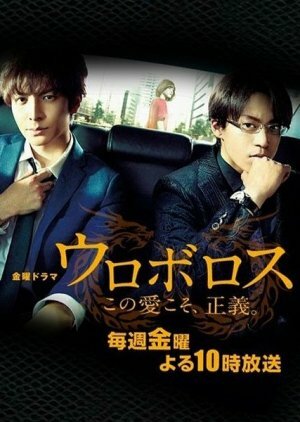 The bonus point for me in this drama is the fact that Ikuta Toma and Oguri Shun are my Japanese Actor biases. Then add up Ueno Juri into the tandem, that makes it a perfect cast for me. They are a bunch of veterans and I felt the vibe of the whole drama along with the cast's chemistry. It was really something that these actors can pull off. One minute they are being all funny, then the next they're mad and then all of the sudden they're crying. It's like watching a whirl wind of emotions set to trap me in all those feels. There were times though when they are set up in a ridiculous situation and have to give an over the top acting style (which is sometimes annoying) but they eventually redeem themselves with the dialogues and the funny inserts. But mostly, this drama is full of seriousness and has a heavy feel. It shows that every action has consequences and choices made whether it's right or wrong has its own ramifications. In the end Karma wins everything. I love how they explained what Ouroborus meant, it is actually an ancient symbol depicting a serpent or dragon eating its own tail. The name originates from within Greek language; (oura) meaning "tail" and (boros) meaning "eating", thus "he who eats the tail" (excerpted from Crystalinks), in the drama they explained that it also meant life and death, the cycle of humans who lived then died and lived again. Music wise, this OST really caught my attention. Hearing the sound track felt really familiar, it was as if I heard them before on several dramas. When I researched, Arashi's name came out. That' when I realized the music score felt like listening to Maou's OST which was also sang by Arashi. It was a really good music score which was attractive enough to fit the drama's tone. Another thing that made this enjoyable was the political battles inside the police government and each department. It's fun seeing who's side would win and who along the way would be affected. Usually though due to these political strife the innocent becomes not so innocent due to grudges held. I want to say more but I'm holding myself off since I don't want to give spoiler alerts to anyone. Last note: this drama has a minimal or almost none-existent romance along the story line so I would suggest for people to check out this drama if they are in the mood for the things I have mentioned above except for the romance part.